Ron Litman's companion website to the book. When to Intubate during Neonatal Resuscitation? I was catching up on some reading recently and came across this nice review of neonatal resuscitation in the April 22 issue of Lancet (Manley BJ, Owen LS, Hooper SB, et al. Towards evidence-based resuscitation of the newborn infant. The Lancet; 389(10079): 1639-48). It’s an excellent overview of the physiological process of birth and the principles of neonatal resuscitation. 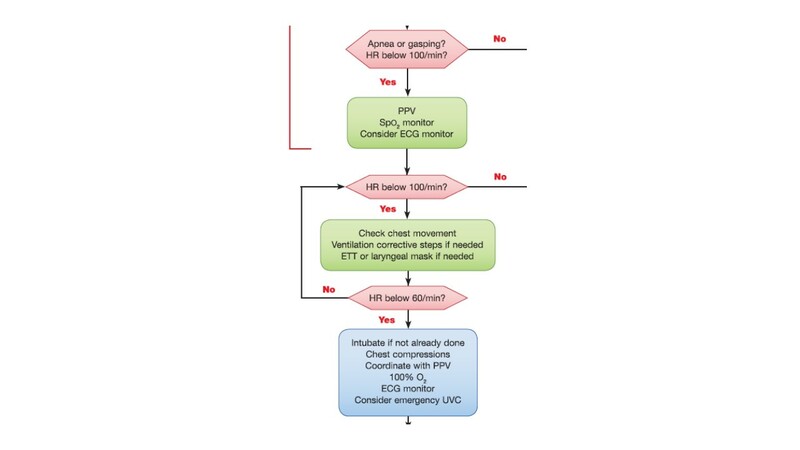 In the article, the authors reproduced the Newborn Life Support Algorithm of the UK Resuscitation Council. The choices within this algorithm rely on the appearance of “chest movement” during inflation. This term presumably means the rise of the thoracic cavity that is an indication of lung inflation. But in clinical practice, this is difficult to discern, especially in the newborn population, and is often confused with the movement associated with gastric inflation. Over the years, I have been asked to consult on several medical malpractice cases wherein a newborn suffered hypoxia despite the treating clinicians’ insistence that they were achieving adequate “chest movement”. These clinicians were so convinced of the adequacy of their bag-mask ventilation that they discounted the severely low oxyhemoglobin saturation and heart rate values, and did not consider the placement of an endotracheal tube or laryngeal mask airway. The adequacy of bag-mask ventilation should not be judged on “chest movement” but rather on achievement of normal oxyhemoglobin saturation and heart rate values. If these are subnormal, clinicians should presume that bag-mask ventilation is not sufficient, and the child should immediately receive tracheal intubation or placement of a laryngeal mask airway. Posted on May 20, 2017, in Uncategorized. Bookmark the permalink. Leave a comment.